When you’re buying gifts for a newborn baby, it’s basically just a chance for you to buy the things you already needed for them. They’re still too young to enjoy most toys until they get to the older end of 1. It’s still fun to buy them cute things that they need, though. The SwaddleMe Original Swaddle is an adjustable infant wrap. No need to worry about them slipping out of the swaddle once you’ve wrapped them. This swaddle features a secure hook and loop closure for easy, safe swaddling. The Summer Infant line of wearable baby sleep products have been designed and tested to keep babies snug, safe and comfy every night during their first year. 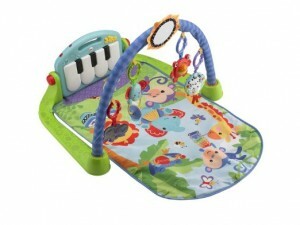 Another gift from Summer Infant, this is more of a fun toy for your infant. It’s designed to get them moving. Give the Jiggypotams a squeeze and he’ll giggle and shake all around. I have a feeling it will leave the whole family laughing and help get that little one crawling. The Chase ‘n Go Ball Popper is definitely an interactive game for babies. 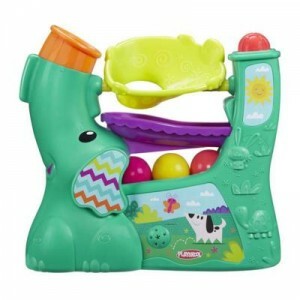 This ball popper toy packs lots of play into a compact size. It’s for the older kids in this group (1+) and has multiple ways to play and helps encourage a variety of developmental benefits. A good thing about this toy is that your little one will still have fun with it until he’s a toddler. They can play sitting or standing, push the big red button, start one of 6 tunes and watch the balls pop. To mix it up, turn the elephant’s trunk and balls will continuously cycle through the toy, which can help encourage baby’s eye tracking. Turn the trunk away and have them chase the balls as the launch around the room. 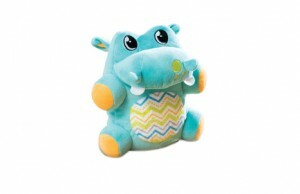 This hippo toy is made from natural latex rubber and contains no phthalates or BPA, so it’s 100% safe for baby. He has tactile, textured, chewable features, soothing smell and audible squeak to stimulate all the senses. 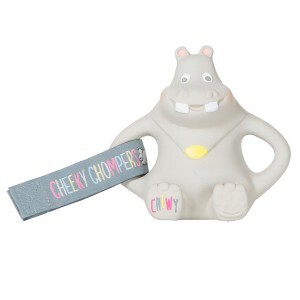 The hippo chewy teether toy comes in one size and a velcro strap that you can attach on a harness buggy, car seat or anywhere else you’re going on the move. I love this toy. I was at a baby dedication and someone gave it as a gift to the baby and I thought it was a great idea! 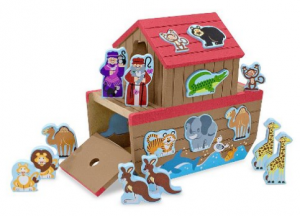 This is another toy for the older kids (1+), but once they’re sitting up and interacting with more around them, they’ll love sorting all of the animals into the ark. If they’re too young when they receive it, they’ll at least enjoy teething on the pieces. There are 26 animal blocks, plus Noah and his wife. Melissa & Doug always makes quality toys that I feel confident giving as gifts. Stacking toys are always a great gift for this age group. 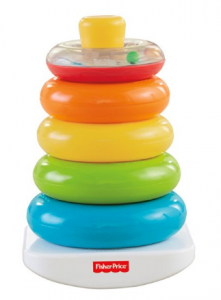 The top stacker has swirling beads to stimulate visual development. There’s a lot of development packed in this little, inexpensive toy. It also helps little ones develop gross motor skills as baby bats and rocks the toy, helps them differentiate among colors and sizes of rings, and helps strengthen baby’s sense of touch. At such a low price point, this is an ideal gift and a classic. All of my girls have loved this gym. I still pull this toy out when we have guests come over with babies. Every time baby kicks, music plays. Plus they get to play with all of the moving toys hanging over their head. You can move the arch down for the baby to play with during tummy time and even move the piano so baby can sit up and play as they get older. I love toys that grow with your baby. 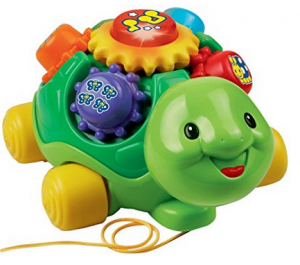 When your child spins the colorful gears around the turtle, it will teach them the names of insects, action words and sounds. Once they start moving, they can pull the turtle around with them by the string. This toy encourages discovery and exploration. 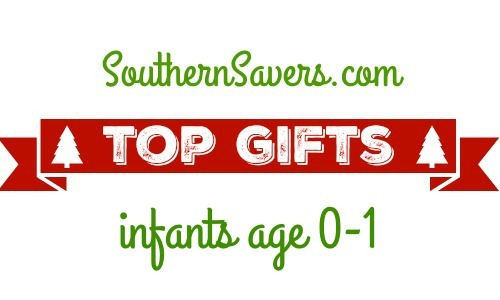 This is the perfect toys for babies age 1-2. 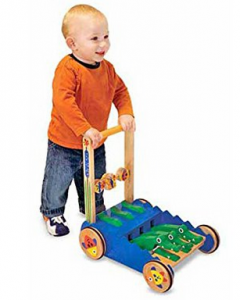 It helps children learn to walk by encouraging them to walk further with the noises it makes as the walker is pushed. 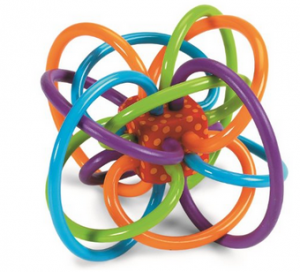 This teether is a maze of soft, continuous tubes that your baby will love. It promotes clutching and two-handed play,and the middle piece contains a pleasing rattle sound. Buy this one for the long Christmas road trips to give baby something to play with. This giveaway is sponsored by Summer Infant, Hasbro and Cheeky Chompers, but all opinions are 100% my own.